Formal nights, really? You’re killing me Celebrity. So, it’s true. We’re headed out on a bucket list kind of adventure. An 11-night Mediterranean cruise with two of our most favorite people on earth – Maylene’s parents. Exciting, right? And stressful! Boy – is it ever stressful! When you pack for a cruise, not only are you packing for regular touring like you normally would when you’re traveling but you also have to pack for all the fun in the water you’ll be having on the ship plus hopefully a yoga class / early morning jog to keep off the buffet food. Then there’s the need to dress for dinner. That’s right – dress for dinner. What’s a girl to do?? In addition to the nine other dressy nights, there are TWO – count ’em two formal nights on this cruise and when they say formal, they pretty much mean it as far as I can tell – but I’ll report back more on that later. Complicating the packing requirements are the need to remain lightly burdened for maximum touring post-cruise for ten more days. A lot of careful consideration later and I decided that I simply cannot be confined to a single backpack for the entire month-long multi-climate adventure. Instead, I packed my five pairs of shoes plus two formal dresses, five cute evening numbers, five dinner blouses, four touring shirts, five touring pants/skirts, four scarves, four bras, five underwear, leggings/hose, three swimsuits, electronic devices, journal, travel pillow, makeup, cosmetics, and all the other random requirements into two carry-on bags. And really, I’m just guessing here since I haven’t counted and at this point can’t bring myself to unpack to get the count accurate – I’m sure we can all agree that I have brought a ton of options. Okay – maybe just 75 pounds. One container I’m using is a small, 22″ rolling suitcase from Swiss Army that I’ve had for years and while I still think I have a chance of getting it on the plane as a carry-on with the larger backpack — it will instead be checked for the long flight to Rome with layover in Amsterdam. 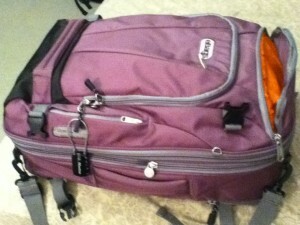 I’ll use my tried and true Deuter collapsible day bag as another carry-on backpack for the flight over. This will help distribute some of the weight from my larger ebags Motherlode Weekender TLS backpack making airport navigation easier. I have to say though, I have been very impressed with the amount of space in the Motherlode and the great pockets and organizing options available. I would highly recommend that bag for a discrete, compact backpack – which would normally be all I would need for normal touring but then they mentioned formal night. And all logic went out the window for me. 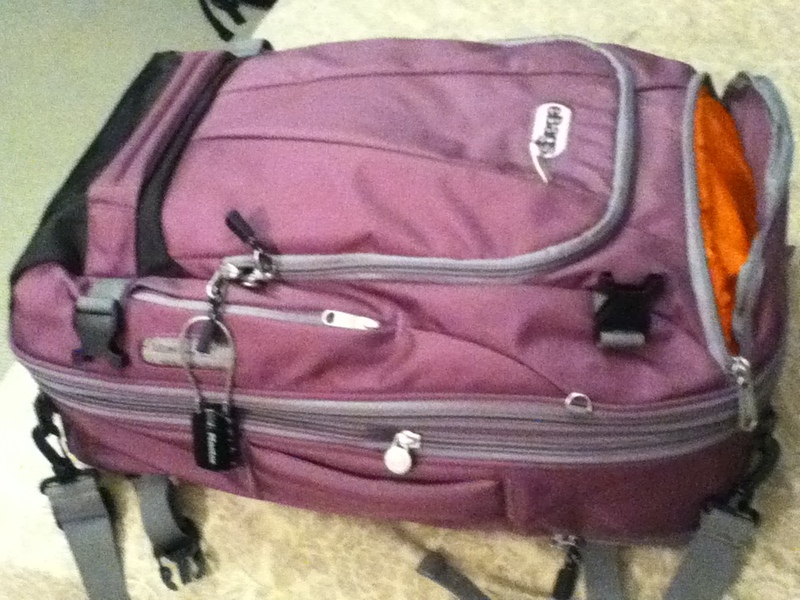 I managed to keep it fairly contained but am still traveling with twice as much as I usually have.